Planning accepts applications for zoning approvals required by the Planning and Zoning Commission, Architectural Review Board, Board of Zoning Appeals, the Administrative Review Team, and City Council. Planning strongly encourages applicants to call and schedule an appointment to submit an application. Call Planning at 614.410.4600 to set up an appointment. Applications consist of the original application form complete with the applicant’s contact information, required plans, and other information. In addition to this form, checklists are available for each type of application that includes the lists of information required for each type. The application process section will walk you through the various steps of submitting an application for the Planning and Zoning Commission, Board of Zoning Appeals, Administrative Review Team, and Architectural Review Board. Application Day: Although applications may be submitted to Planning on any Tuesday. You may call 614.410.4600 to set up an appointment. No appointments are accepted after 4 p.m. Application meetings are held at the Department of Development, 5800 Shier Rings Road. A staff member will receive your submission and an email reciept will be sent within 24 hours verifying your submittal for zoning review. Following the email receipt, the applicant will receive an email verifying completeness of the submission and any outstanding items required for review. The email will contain the contact information for your case manager as well as the case number assigned to your application. Plan Review Phase: All application materials will be reviewed by applicable City departments for accuracy and adherence to the Zoning Code and other City requirements. The departments involved are Planning, Building Standards, Engineering, Review Services, Parks, Police, Streets and Utilities, and the Law Director. Review Comments: Depending on the complexity of the case, a comment letter outlining issues and concerns from each department is typically issued to the applicant. Additional plans and information may be required as a result of the initial review. If so, the applicant will be informed of all deadlines for the submission of revised plans, if necessary. Meeting Agenda& Notices: If additional or revised materials are received and appropriate changes have been made, the application is scheduled for an agenda of the appropriate reviewing body. Agendas and notices for the meeting are sent to the applicant, surrounding property owners, and registered homeowner associations in the area generally up to two weeks prior to the meeting. Planning Report: On the Monday prior to the scheduled meeting, a Planning Report will be emailed to the applicant and posted on the City’s website. The report contains a description of the proposal, location information, and a recommendation from Planning of approval, disapproval, or approval with conditions. Meeting: All meetings are held at 6:30 p.m. at the Dublin Municipal Building, 5200 Emerald Parkway, unless posted otherwise. Hearing: The meeting procedure includes a presentation by Planning followed by a brief presentation by the applicant, if necessary. Following the presentation, the Commission or Board members may ask questions in order to clarify any outstanding issues before making their decision. Members of the public are then invited to make comments, followed by Commissioner/Board member comments and a decision by the reviewing body. Record of Decisions: Once a decision is rendered, a record of the decision by the Planning and Zoning Commission, Board of Zoning Appeals, and Architectural Review Board will be sent to the applicant, typically within one month of the meeting, to document the decision and conditions that may have been attached. Final Decision: Certain decisions will require City Council action. For applications requiring City Council review, Planning coordinates with the Clerk of Council to determine applicable meeting dates. The case manager will advise you of the required materials, schedules, and meeting format. Permits: Once a final decision is rendered, applicants may proceed with obtaining a building permit or required permits. The Planning and Zoning Commission reviews all applications for Planned Unit Development Districts, conditional uses, preliminary & final plats, and provides a recommendation to City Council for rezoning’s. The Commission typically meets on two Thursday’s each month at the Dublin Municipal Building, 5200 Emerald Parkway at 6:30 p.m. unless otherwise advertised. 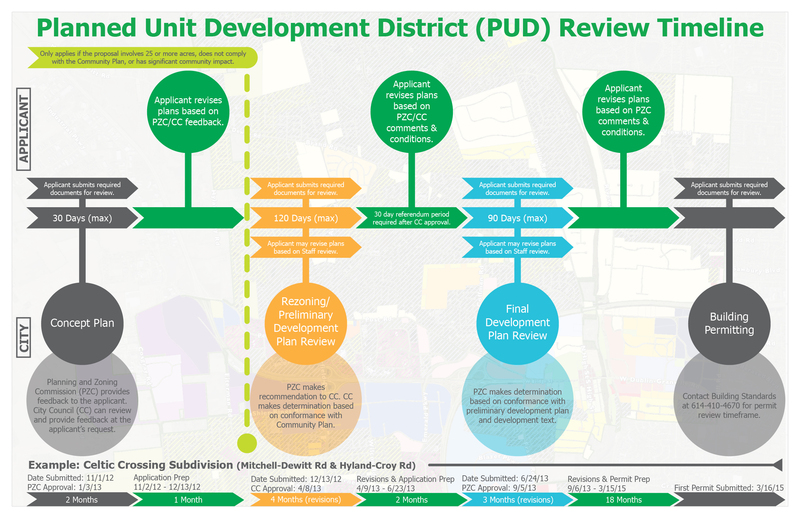 The Concept Plan is often the first step of the Planned Unit Development District approval process, although it is not required. While not legally binding, Concept Plans allow the Planning and Zoning Commission to discuss the general concept of the proposed development with the applicant and determine whether the proposed development is appropriate for the site, consistent with the Community Plan, and worthy of moving forward through the Planned Unit Development District approval process. Concept Plans may be reviewed by City Council if desired by the applicant. The Rezoning/Preliminary Development Plan is the first formal step in the Planned Unit Development District approval process. Approval of the Preliminary Development Plan establishes the permitted uses, density, development requirements, and general layout of the site. The Planning and Zoning Commission makes a recommendation for approval, disapproval, or approval with conditions to City Council, which makes the final decision. The Final Development Plan is typically the final step in the Planned Unit Development District approval process and requires the highest level of detail and plan refinement. The Planning and Zoning Commission determines if the proposal is consistent with the approved preliminary development plan and is ready to proceed to building permit and Certificate of Zoning Plan Approval submittal. Amended Final Development Plan applications are required for revisions to approved final development plans. The Planning and Zoning Commission determines if the proposed modification is consistent with the approved preliminary development plan and is ready to proceed to building permit and Certificate of Zoning Plan Approval submittal. In unique circumstances, proposed developments may warrant this preliminary, non-binding review by the Planning and Zoning Commission prior to filing a formal application. Please contact Planning at 614.410-4600 to determine if your proposal qualifies for informal review. Rezoning changes the zoning classification of a property, which may include different permitted and conditional uses, and development standards. Standard District Rezoning requires review and recommendation by the Planning and Zoning Commission and two readings by City Council. The Planning and Zoning Commission makes a recommendation to City Council on Standard District Rezoning applications. While often desirable in the zoning district in which they are proposed, uses requiring conditional use review have potentially greater effects on their surroundings than permitted uses and as a result require additional scrutiny by the Planning and Zoning Commission to ensure that the use is appropriate for the location. A Certificate of Zoning Plan Approval must be obtained for the property within one year of the conditional use approval. The Preliminary Plat application is the first step in creating a subdivision, involving the preliminary placement of development lots, public streets, and other associated facilities.The Planning and Zoning Commission makes recommendations to City Council on Preliminary Plat applications. The Final Plat application is a refinement of the Preliminary Plat and presents the final configuration of lots within a subdivision and/or finalizes the placement of public streets and utilities. The Planning and Zoning Commission makes recommendations to City Council on Final Plat applications. The City of Dublin Board of Zoning Appeals must review all applications for variance requests, administrative appeals for zoning or building decisions issued by the City and special permits for certain other activities. The Board generally holds a meeting the fourth Thursday of each month at the Dublin Municipal Building, 5200 Emerald Parkway at 6:30 p.m., unless otherwise advertised. Applicants may request a Non-Use (Area) Variance when an aspect of a proposed development does not meet one or more requirements of the Zoning Code (or the Planned Unit Development regulations for single family homes in Planned Districts), such as setback, height, or other similar requirements. Variances may only be approved after the Board of Zoning Appeals finds that conditions unique to the property result in a practical difficulty in meeting the requirements of the Code. Appeals to the Board of Zoning Appeals may be taken by any person that disagrees with decisions rendered by Planning regarding Zoning Code regulations. The Board of Zoning Appeals also hears Appeals from the Building Code and the Property Maintenance Code. Applicants may request a Use Variance when a property cannot reasonably be used for any of the permitted or conditional uses allowed by the zoning district in which the property is located. Use Variances may be granted only if the applicant demonstrates that a hardship unique to the property, prevents the use of the property as it is zoned. City Council makes a final determination of Use Variance requests after receiving a recommendation from the Board of Zoning Appeals. Due to unique characteristics relative to location, design, size, operation, traffic circulation, or need for public services, several specific uses outlined in the Zoning Code require review and approval by the Board of Zoning Appeals to ensure that the use is appropriate for the proposed location. The Architectural Review Board reviews modifications to any site or structure within the limits of the Architectural Review District (Dublin Historic District) in addition to any properties identified in Appendix G of the Zoning Code. Modifications include plans to construct, alter, demolish, or change the exterior of any structure (windows, doors, siding, exterior paint colors, etc.). Site improvements such as parking lots, fencing, extensive landscaping, and signs also require ARB review and approval. The Board typically meets on the fourth Wednesday of each month at the Dublin Municipal Building, 5200 Emerald Parkway at 6:30 p.m., unless otherwise advertised. The Architectural Review District falls within the Bridge Street District. As a result, the Administrative Review Team reviews all applications for Architectural Review District. For development in the Historic District, please contact Lori Burchett, AICP, Planner II, at 614.410.4656 or lburchett@dublin.oh.us. Architectural Review Board Applications may be found under the Administrative Review Team’s Application Requirements. The Administrative Review Team is responsible for the comprehensive review of each application and making recommendations to the Planning and Zoning Commission, Architectural Review Board, Board of Zoning Appeals, or City Council where required. The Administrative Review Team is tasked with making decisions in an efficient and timely manner based on evaluation of objective development standards and specific review criteria. While these objective standards and criteria must guide the decisions of the Administrative Review Team, it is recognized that some degree of subjectivity must be part of the Team’s deliberations. For development application inquiries in the Bridge Street or West Innovation Districts, please contact Claudia D. Husak, AICP, Senior Planner at 614.410.4675 or chusak@dublin.oh.us. The Pre-Application is a non-binding application review completed by the Administrative Review Team prior to submitting a formal application. A Development Plan is required prior to beginning construction on all or any portion of a property within the Innovation Districts. 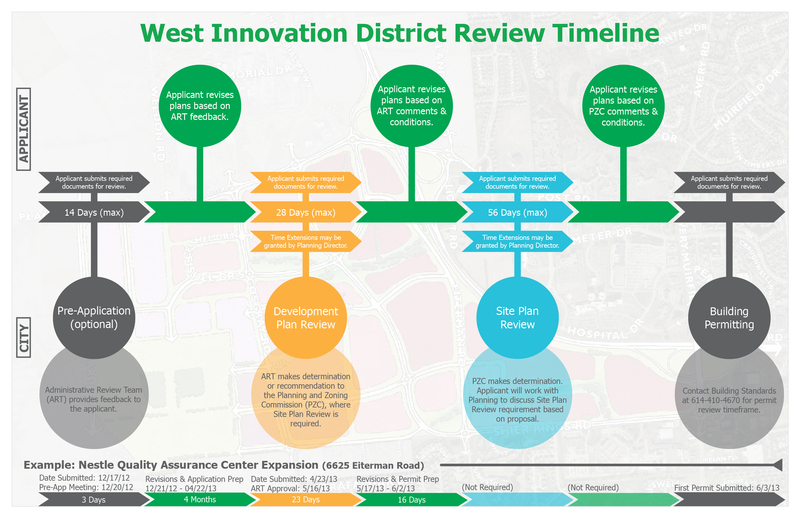 This review is also required for modifications of an approved development within the West Innovation District. Applications that meet all the requirements of the Innovation Districts are reviewed by the Administrative Review Team. Site Plan review is required when a proposal does not meet the requirements of the Innovation Districts, an Administrative Departure is denied, or when requested by the applicant. This review is completed by the Planning and Zoning Commission and would be identified during the development plan review. Administrative Departures can be requested when the strict enforcement of the zoning and development requirements of the District may be unreasonable or impractical to meet. An Administrative Departure is reviewed by the Administrative Review Team. Minor Project Review provides an efficient review process for smaller projects that do not have significant community effects. The purpose of the Basic Plan Review is to outline the scope, character, and nature of proposed development in the Bridge Street District. 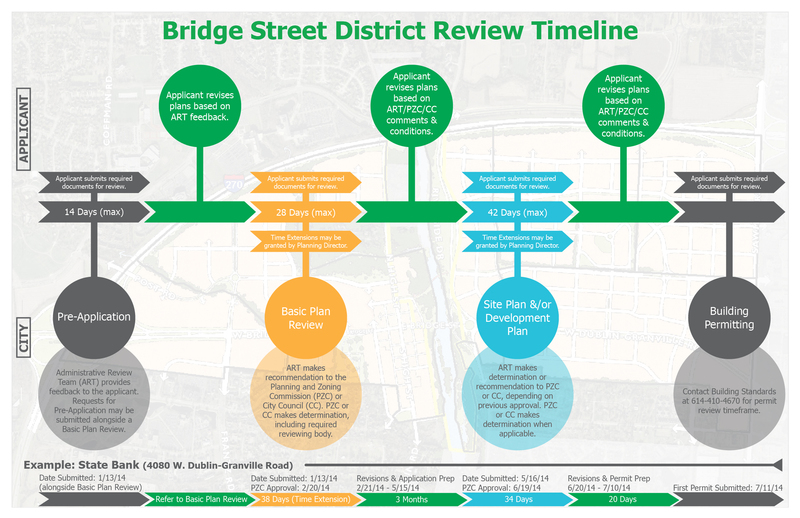 The process is intended to allow the required reviewing body to evaluate the proposal for its consistency with the Bridge Street Corridor Vision Report and the Zoning Code while providing clear direction to the applicant and the ART in its review of an application for Development Plan Review. The Basic Plan Review is also intended to provide an opportunity for public input at the earliest stages of the development process. The purpose of the Basic Plan Review is to outline the scope, character, and nature of proposed development in the Bridge Street District. The process is intended to allow the required reviewing body to evaluate the proposal for its consistency with the Bridge Street Corridor Vision Report and this Chapter while providing clear direction to the applicant and the ART in its review of an application for Site Plan Review. The Basic Plan Review is also intended to provide an opportunity for public input at the earliest stages of the development process. The purpose of the Development Plan Review is to ensure that the street network and block framework meet the requirements of §§153.060 and 153.061, and §153.063 as applicable, and to ensure that the proposed development is consistent with the general development requirements of the City with respect to such elements as infrastructure, transportation, and environmental considerations. The purpose of the Site Plan Review is to confirm that the proposed development of an individual site and building is consistent with the Bridge Street District regulations. The Site Plan Review process is intended as a review of the individual development regulations of §153.059 and §§153.062 through 153.065. Applications for Development Plan Review that deviate from one or more of the requirements of §§153.060 and 153.061 and do not qualify for an Administrative Departure under the provisions of §153.066(H) are reviewed by the Planning and Zoning Commission. Applications for Site Plan Review that deviate from one or more of the requirements of §153.059 and §§153.062 through 153.065 and do not qualify for an Administrative Departure under the provisions of §153.066(H) are reviewed by the Planning and Zoning Commission. The purpose of the Master Sign Plan review is to allow for a greater degree of flexibility and creativity in sign design and display. Master Sign Plans are intended to deviate from sign regulations of §153.065(H) due to unique conditions and to allow for coordinated sign packages consistent with the Bridge Street District Sign Guidelines.